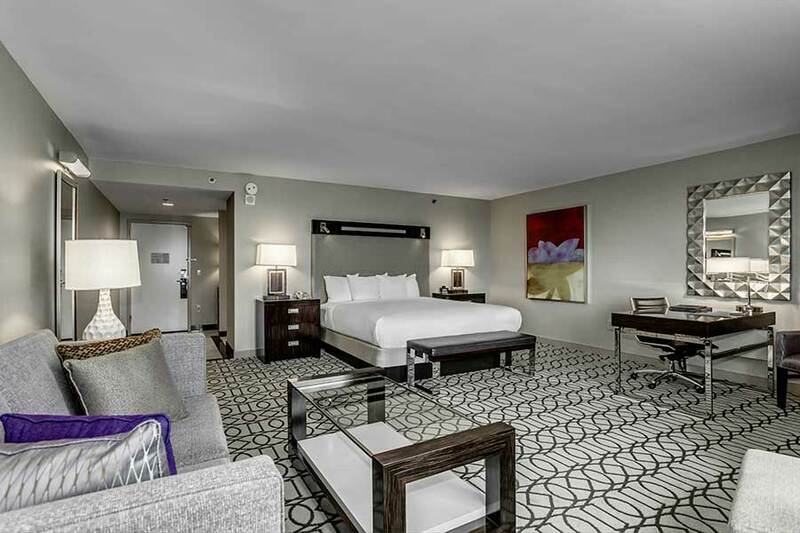 Guest rooms at the Hilton Columbus at Easton are luxuriously appointed and spacious. Our 400 sq ft. standard guest rooms feature Queen/Queen or King beds. Standard appointments include a 55 Inch LCD HDTV with 7 complimentary movie channels. For comfort and convenience, each room has a large work desk and complimentary WiFi. 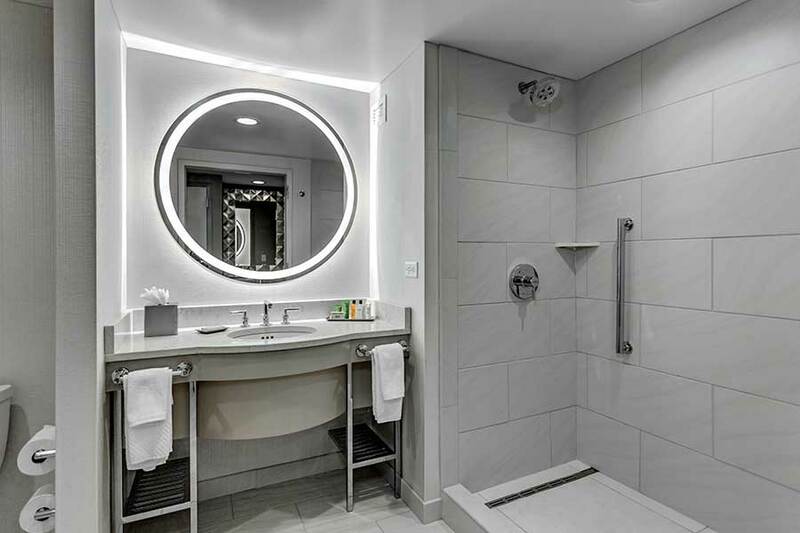 Our spacious Italian marble bathrooms have heated mirrors and a hairdryer. 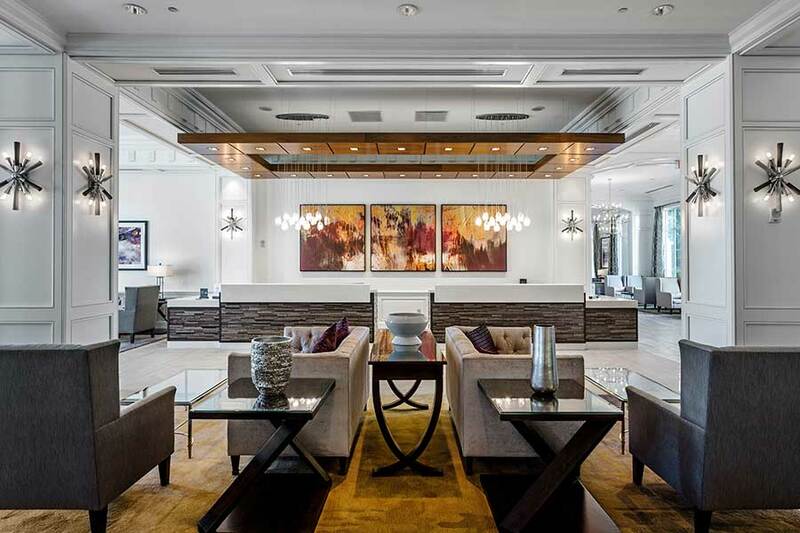 The hotel also offers concierge Executive Level Rooms with upgraded amenities and access to the Executive Lounge for breakfast, luxurious suites and a Presidential Suite. Our beautifully appointed 400 sq ft. guest rooms feature Queen/Queen or King beds. A 55 Inch LCD HDTV with 7 complimentary movie channels. Work desk and complimentary WiFi. Spacious Italian marble bathrooms with heated mirrors and a hairdryer. Our 750 sq. ft. suites feature, private bedroom with connecting living room that includes a sofa bed and armoire with additional TV. The elegantly appointed suites also feature turndown service, 55 Inch LCD HDTV with 7 complimentary movie channels. Work desk and complimentary WiFi. Spacious Italian marble bathrooms with heated mirrors and a hairdryer. 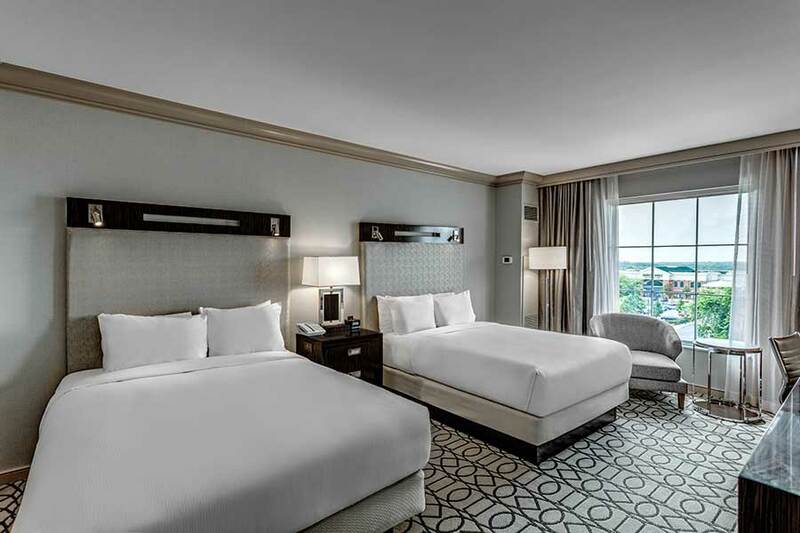 68 upscale Executive Level accommodations with all the features of our standard rooms plus expanded bathroom amenities, bathrobes during your stay, turndown service, and access to the Executive Lounge offering PM Hors d’oeuvres and AM continental breakfast. 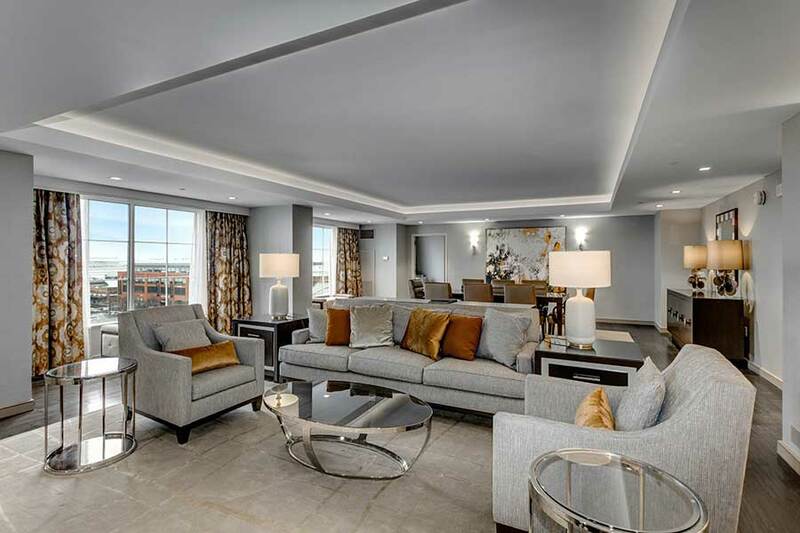 The Hilton Columbus at Easton also features a luxuriously appointed 1,200 sq. ft Presidential Suite. These exquisite accommodations feature a spacious lounge with elegant furnishings, a dining room and a kitchen that makes this the perfect suite for entertaining. 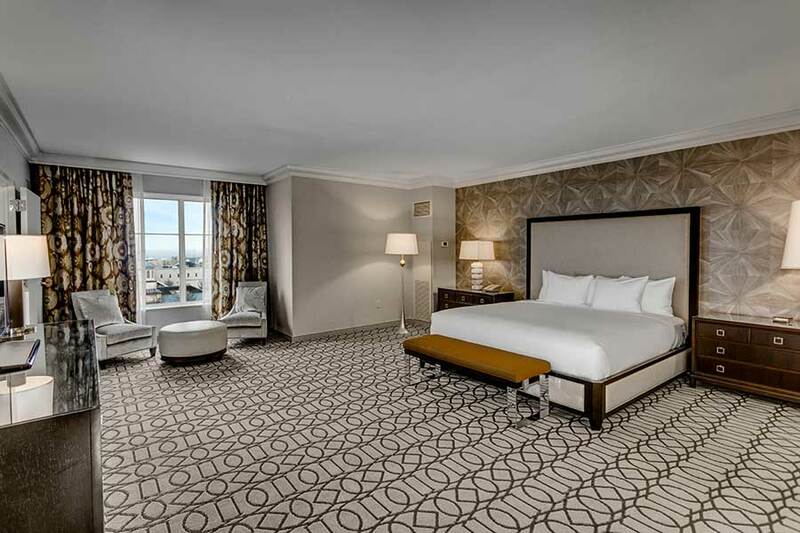 The oversized separate bedroom features a king size bed and leads through to a luxurious bathroom with Italian marble, separate bath and shower and upgraded amenities. To Check Availability and Rates – Please contact the hotel directly at 614-414-5000 and speak with our reservations department. The Hilton Columbus at Easton offers a newly designed and well-appointed Executive Lounge for our Executive Level Guests. The lounge is attended Monday through Friday from 6am-10am for a continental breakfast. An evening reception takes place during the week Monday through Friday from 5pm-8pm. Executive Level Guests have access to the Executive Lounge anytime throughout the week, including Saturday and Sunday. Executive Lounge found on first level of the hotel. See front desk for details.